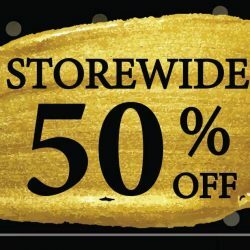 Till 26 Nov 2018 Lee Hwa Jewellery: Black Friday Sale with 50% OFF Storewide! Black Friday weekend is here! 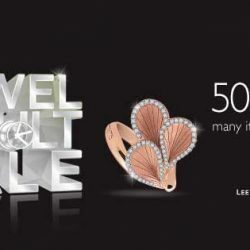 Enjoy 50% off storewide from 23 to 26 November across all Lee Hwa Jewellery boutiques! Terms and conditions apply. You’ve celebrated your life’s milestones with Lee Hwa Jewellery, and now they invite you to celebrate one of theirs—their 48th Anniversary! In light of this joyous occasion, they’ll be having massive promotions across their jewellery, including rings, necklaces, wedding bands and more, every week. Visit your nearest boutique from now until 11 October to enjoy tiered discounts of $48, $480 and $1480. T&Cs apply. An anniversary or a special one's birthday coming up? Dun miss this upcoming Lee Hwa Jewel Vault Sale from 9 to 13 September with up to 70% off diamonds and jewellery! 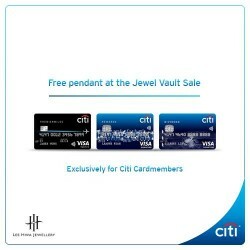 Be the first 200 customers to pay with your Citi Credit Card, and receive a FREE limited edition pendant. If you are not a Citibank cardmember, just flash the coupon below and get an additional 5% off from 9 to 11 September! 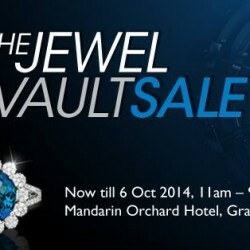 Get up to 80% off at the Lee Hwa’s Jewel Vault Sale! Be the first 200 customers to pay with your Citi Credit Card, and receive a free limited edition pendant! Happening from 24 to 27 September 2015 at Mandarin Orchard Hotel. T&Cs apply. Having another anniversary and do not know what to buy? Proposing to your pretty girlfriend but do not have time to prepare the ring yet? Or just wish to pamper yourself with some beautiful jewellery? Here comes the chance! Lee Hwa Jewellery was the official jewellery for Singapore Fashion Week 2015. 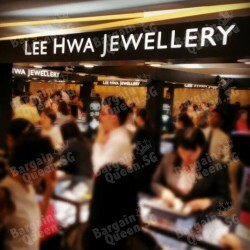 Back to 1970s, Lee Hwa Jewellery was incorporated and operated its first store at Circuit Road. With the long history and advanced technology, Lee Hwa Jewellery always aims to bring you the best. 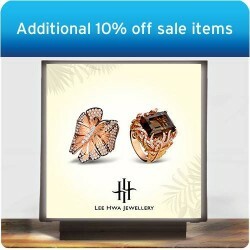 Lee Hwa Jewellery’s Dazzling Summer Sale is now on. Enjoy up to 50% off storewide, plus get an additional 10% off sale items, exclusively with your Citibank Card. Offer valid till 31 July 2015. Terms and conditions apply. 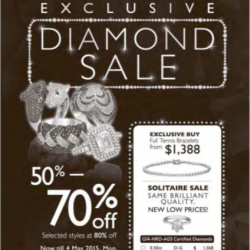 Lee Hwa Jewellery offers you 50% to 70% off on selected styles at 80% off on Diamond Sale until 4 May 2015, 11am to 9pm. Exquisite and widest selection of diamond jewellery at exceptional value. 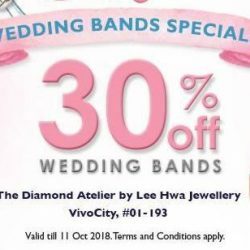 Get Up to 50% - 70% Off Exclusive Diamond Sale @ Lee Hwa Jewellery. Lee Hwa's JEWEL VAULT SALE is now on. Over 10,000 exquisite jewellery at 50-70% off! Selected styles at 80% off! GIA solitaire clearance at drastically reduced prices. Venue: Mandarin Orchard Hotel, Grange Ballroom, Level 5.